Each of the carriages, even the separate packs, connect together and all of the dinosaurs come with a little hole in their foot which connects them onto the dinosaur train so they don't fall over. Ours weren't really affected by that though as Charlie thought it would be more fun to have as many dinosaurs in each carriage as possible, I just hope that none of herbivores are mixed with the carnivores or we may have some trouble on board! The train itself lights up and makes noises when the button at the front is pressed which Thomas loves to do and although the dinosaurs don't make noises, the boys enjoy making the 'roars' themselves and I think that this promotes more imaginative play as they are joining in with it all too. Each of the figures has their own name so Thomas can identify them easier and they are very detailed in design. Not only that but since they come in a pack of 3, Thomas has asked if he can have some more for Christmas to build his collection. Unlike the Interaction Figures, which had moving parts, these dinosaurs don't and are more for collecting or using on the train itself. They are small in size too and at £4.99 for a pack of 3, are perfect for little boys when they get their pocket money. 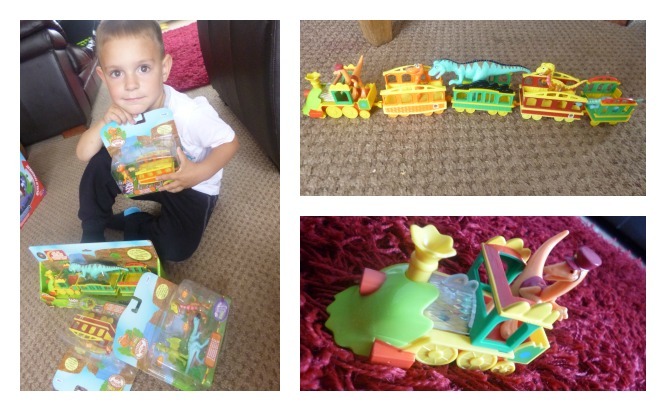 You can see more of the Dinosaur Train toys on the TOMY website. Both of my boys love drawing but as most parents will know and experienced, crayons, felts and pencil marks always end up on the walls. Since we have redecorated our livingroom, I have been trying to put off letting the boys do craft work in there as I don't want to spend a fortune replacing it and so when TOMY asked us to review Aquadoodle, the no mess, no fuss, water based art play, I was sceptical as to whether it would actually work as described. 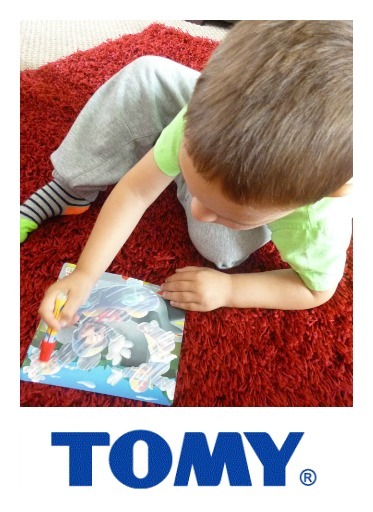 TOMY state that Aquadoodle allows no mess drawing by using water to create fun pictures. No pencils, no felts and none of the dreaded crayons are used, only water and when the water has dried, the pictures will fade and you can start to colour in again as they are completely reusable. We were sent 2 products from the Aquadoodle range, the Mickey Mouse Mini Mats and the Travel Drawing Bag and this is what we thought of them. You get 3 mats and 1 pen in each pack. 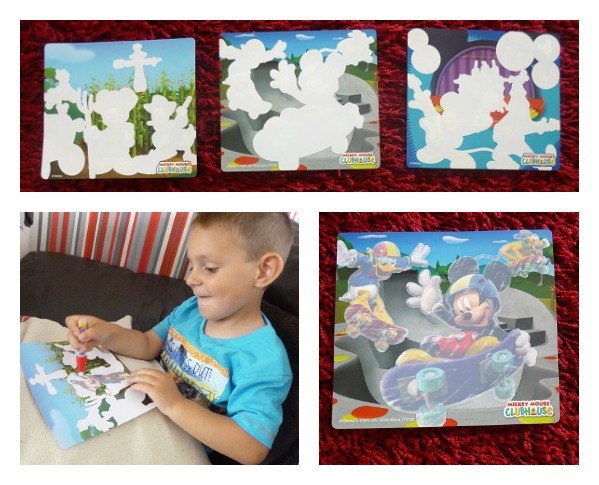 Thomas loves Mickey Mouse and so loves these designs but you can also get other characters, such as Chuggington, to suit your child's preference. Each picture consists of a backdrop and then missing white parts which are the bits to be coloured. As the pen go across these white parts, they magically fill with colour to reveal the picture behind. Simply fill the pen with water and you're off. Scribble, colour whatever you do, it's impossible to go out of the lines. I would say it is ideal for young children who are taking their first steps into being creative. Scenes magically fade to colour over and over again. and everything is reusable. Once the pen runs out, simply twist the cap off and fill it back up with water and that's it, simple. Each of the pictures are easy to do and even Charlie loves to give them a try. He might not be able to fully colour the pictures but does have fun trying and the fact that he's using a pen is great for learning his hand-eye coordination. This padded bag opens out and each of the 2 sides has a drawing area. Thomas loves to create a nice drawing on one side and then switch to the other side while the first lot dries. The Aquadoodle Travel Drawing Bag is great for no mess drawing on the go as it's the perfect size just to pop into the car and take on days out. The travel bag comes complete with a pen to do all the drawings you can think of and even has a little place inside to keep the pen safe whilst on the go. It is a thick marker type pen so easy for young children to hold. So, does it work I hear you ask? I must admit that after being sceptical at first, it actually does work. The Aquadoodle pen will only write on the mat and bag accessories and so any strokes that go astray wont leave any marks whatsoever. All you need do is fill the pen with water and it writes. There is no ink, no mess and it is non-toxic too. The Aquadoodle range can be purchased from all good retailers.